A recent survey or servers and bartenders revealed that special events increase the number of clients at their restaurants, improve morale among the staff and encourage people to return to the restaurant on a non-special event night. What is a Special Event? It can be any number of things. There are theme nights, entre specials, charity nights, room rentals, you name it. Having great Yelp! ratings is a fantastic way to draw in transient diners. But, the problem with transient diners is that, well, they’re just that – transient. With them, you can’t count on a return visit, no matter how fabulous the food and service were and you can’t count on news of your delicious specialty dish spreading via word-of-mouth in the community. There is a great new trend in restaurant event offerings that will draw in locals, though, and that is the concept of Charity Nights. With local diners, you can count on return visits if the food and service are fabulous and you can count on word of your delicious specialty dish spreading throughout the community. What is a Charity Night? The basic idea behind you offering a Charity Night is that you will give back to your community (or a larger non-profit) a portion of the profits that are garnered during the event. In general, you will establish a certain time-period during which the event takes place and a portion of the profits from the dishes (or drinks or desserts, you choose) during that time are in turn given to a non-profit organization. In the restaurant setting, you can choose to either give a percentage of profits to charity or you can allot a certain dollar amount from each sale to go to charity. For instance, you can advertise that for each order of your basic, least expensive pasta plate, priced at $9.99, you will donate $0.50 to the charity. Likewise, for your most expensive seafood offering, priced at $27.99, you can opt to donate $1.50 per plate ordered. Or, you can advertise that you will give 5% of all profits to charity. In the end, it’s all the same – you are giving a set portion of your profits to a charity. However, from a customer perspective, it *is* fun to see that portion in relation to the portion of dinner that they are ordering. If your restaurant serves drinks, another option is to offer specific drinks with $1 (or a different amount of your choosing) from each drink ordered going to charity. Use your imagination on how you want to gather the money for donation. What are the steps in pulling off a fantastic Charity Night (or, better yet, a series of Charity Nights)? You may think that the first step is to choose a day or days on which to offer your Charity Nights. But, really, the first step is to choose your charity(ies). How do you choose a charity that will appeal to your community and your customers? Make a simple 3×5” card or piece of paper that announces that your restaurant is in the planning stages of community Charity Night events. Ask your existing customers to jot down their favorite charity and drop the paper in a jar. Do this over the course of two to four weeks. Ensure that your waitstaff is mentioning the customers this exciting new event and encouraging them to take a moment to participate in selection of the charities. Another great source for choosing your charity is your staff. Ask your staff which charities are interesting or important or have had an impact on them. Finally, consider if there is a local charity that has something in common with your restaurant. Do you market organic meals? Perhaps there is a community garden non-profit that you can support? Is your restaurant known for its amazing after-dinner coffee drinks? Look for a non-profit that supports fair-trade coffee growers. At the end of the planning stage, compile the results and then take some time to research the top-recommended charities. Make sure that any charity you select is a designated 501(c)3 organization. Contact the organization and learn a little bit about what they do and how they benefit the community. Donate to one charity or multiple charities. Offer the Charity Night one time, two times, or many times. Seriously consider selecting multiple charities and offering a series of events. It takes time for people to hear about these types of things and the more you do it, the more seats you’ll fill in your restaurant. Choose an evening of the week on which your restaurant is typically moderately busy. You don’t want to choose the slowest night and you don’t want to choose the night when your seats are already all full. Instead, choose the night of the week when there is consistently a moderate amount of business. This ensures that you will be able to welcome new customers to the event. Once your decided on the number of charities, you can choose the dates for the events. Consecutive dates are best. If you’ve chosen 4 charities, try to select 4 consecutive weeks to offer the Charity Night option for your customers. So, you’ve selected four charities and four dates for the Charity Event. Preferably the dates are all on the same night of the week, on four consecutive weeks. Call it “*Restaurant Name* Giving *Insert Month Name Here*” or a similarly catchy name. Contact the charities that you will be supporting so that they can help get the word out to their existing support base. Make simple flyers, like the one at left. You can use standard paper (but we suggest printing on colored paper if you’re using black ink only). KEEP IT SIMPLE. 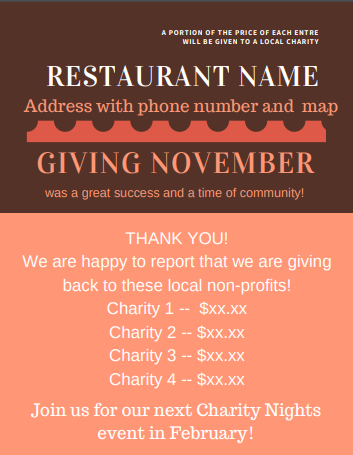 Include your restaurant name, address, the dates of the Charity Nights, and the charities that will benefit from people coming out. Keep it short and simple. Include the flyer with each customer bill in the weeks prior. Post the flyers around town. Give flyers to the charities for them to distribute. An electronic version might be best for this purpose. Consider notifying your local newspaper. Who knows – they may run a story on your restaurant and generosity! Finally, after these weeks of planning and advertising, the day is here. 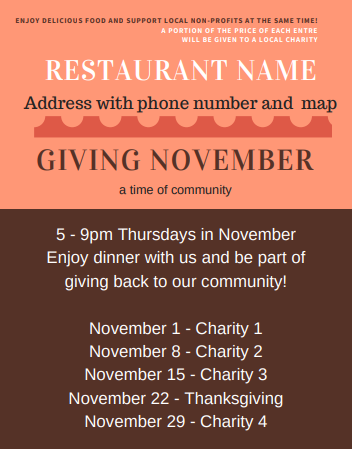 Depending on your community, the first Charity Night might not look much different that any of your other Thursday nights at the restaurant. BUT – make sure that your staff asks each table if they have come as part of the night and encourage your staff to chat a bit with each table about how great it is that the restaurant is going to give back to the community as a result of them coming in on this particular night. Encourage your customers to come back for one of the upcoming Charity Nights. A Charity Night gives your customers a chance to give back to the community. It shows that you are generous and care about the good things that are happening around you. This kind of event encourages locals to invite their friends to your place of business. At a minimum, you will have helped out a worthy non-profit by making a gift to help them with their work. At a maximum, new people have now enjoyed your restaurant and these people are most likely locals who will come back again and again. Building a sense of community results in a stable, consistent customer base for you. It’s worth it.